Ava Catau :: You are what you eat. 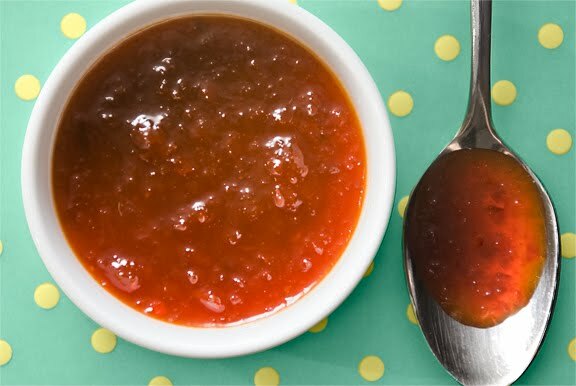 To make the dressing, combine the walnuts, vinegar, and maple syrup in a blender. Puree until smooth. With the blender running, slowly drizzle in the olive oil. If the dressing is too thick, add a bit of water. Season generously with salt and pepper. For the salad, combine the greens and apple slices in a large bowl and toss with the dressing (the above recipe will probably make more dressing than you’ll need for one meal). 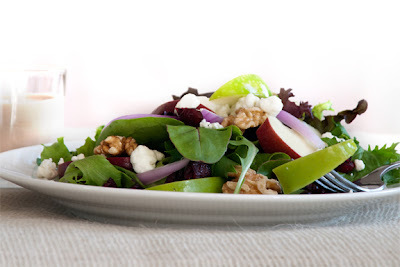 Serve on individual plates and top with the red onion slices, walnuts, cranberries and goat cheese. In a small bowl whisk together the pectin and ¼ cup sugar, set aside. Pulse the bell peppers in a food processor until very finely chopped. In a large heavy pot stir together the peppers, red pepper flakes, vinegars, butter, salt, and remaining 3 cups sugar. Bring to a vigorous boil over high heat, then continue to boil, stirring occasionally, for 5 minutes. Whisk in the pectin mixture. Boil for 2 minutes stirring constantly. Remove from heat and allow to cool to room temperature. Transfer to a glass jar and keep refrigerated. 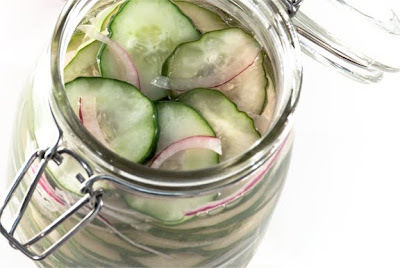 In a glass jar layer the cucumbers and onion slices until tightly packed. In a small saucepan combine 1 cup of water with the sugar, vinegar, and salt. Stir over medium heat until the liquid is warm and the sugar is fully dissolved. Pour the warm pickling liquid over the cucumbers. Cover the jar and refrigerate for at least 24 hours. Pickles can be kept in the refrigerator for at least a month. Slice the tomatoes in half and remove any excess seeds. Finely chop. Place in a mixing bowl and set aside. In a blender or food processor combine the olive oil, rosemary, garlic, salt, and pepper. Puree until the rosemary is finely chopped. Stir mixture into the chopped tomatoes. Add additional salt to taste. 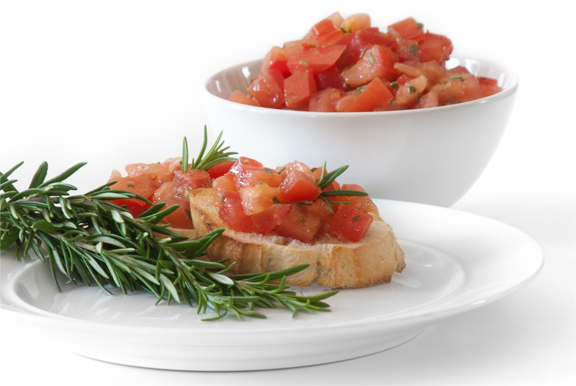 Serve with freshly toasted slices of french baguette. Enjoy!